Okay, I’m a little addicted to making quick, 4 ingredient Jamba Juice smoothie copycats. Why get in my car, drive to Jamba, and spend three times as much when I can create my own at home? Mango-A-Go-Go and Razzmatazz were a success! 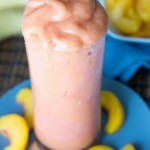 Now come fall in love with my strawberry and peach Caribbean Passion smoothie. 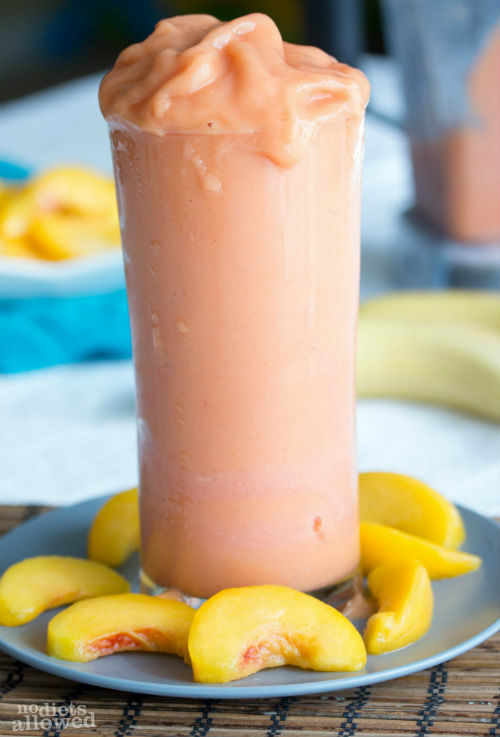 Pure orange juice with a frozen or fresh banana has been an easy, quick substitute for sherbet and frozen yogurt (which Jamba’s recipes call for). 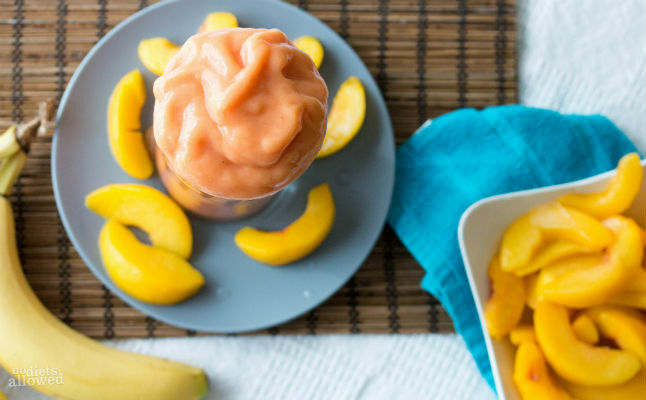 Pureed frozen bananas taste just like ice cream and make your smoothies super creamy. To freeze a banana, simple peel the banana, place in a freezer zip-lock bag, and throw it in the freezer for at least a few hours. I’ve frozen up to 6 at one time together in the same bag. Easy, peasy. I’m always searching for ways to decrease the amount of dairy in my recipes. We eat too much dairy and most of us have dairy sensitivities and don’t even know it. Did you know that 60% of people stop producing the enzyme lactase which breaks down lactose, the main sugar in milk, around age two? Also, dairy sensitivity does not always present through digestive issues like bloating, constipation, and diarrhea. For me, it’s migraines. In addition to migraines, dairy can cause chronic headaches, muscle and joint pain, nasal congestion, and fatigue. Since eliminating dairy, I haven’t had one migraine! Hallelujah! 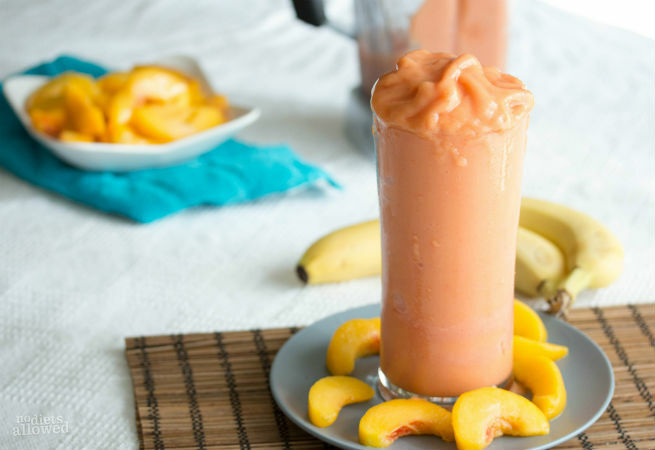 This creamy, tropical Caribbean Passion smoothie reminds me just how deliciously amazing healthy substitutes can make something taste. In a Vitamix blender, add ingredients in order listed. Blend on high until smooth and slushy. Enjoy! How many servings is this? It’s for two servings, Katrina. Hope you enjoy! YAY! I’m happy you enjoyed it, Marcey. Thanks, Bryana, however my goal was not to duplicate Jamba’s recipe but create a great tasting copycat that is a healthier and dairy-free version. Thank you for sharing the recipe though! That is a dairy free version without the banana! Sherbet is not made with dairy. Hi Kat! Thank you for commenting. Since sherbet and sorbet are so closely related, I quickly share what I’ve learned. Sherbet does have milk or cream whereas Sorbet does not. Jamba Juice uses orange sherbet which unfortunately does have dairy. I’m truly in love with frozen bananas especially in this recipe. Thanks again for helping me clarify the difference between sherbet and sorbet.